It has taken quite a while but the bike (or walking!) trail between Cowes and Wonthaggi is now completed. The last section between San Remo and Anderson has been built. So of course we have to ride it. 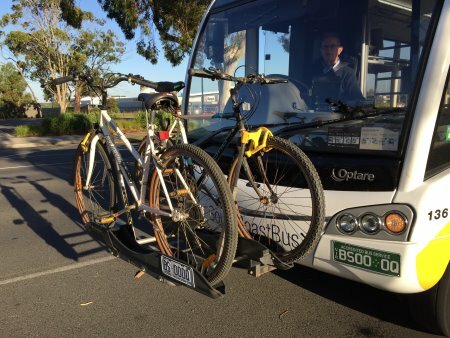 Wonthaggi Bus Lines has installed a rack on the front of their buses, suitable for two standard adult bicycles. We decide to get the bus from Smiths Beach to Wonthaggi and ride back towards Phillip Island. This has several advantages. If we have a mechanical problem at least we are heading back home, the sun would be behind us for most of the ride, and we would not be constrained by the bus timetable. Fortunately there is hardly a breeze the day we set out so we are not riding into a headwind. The Rail Trail between Wonthaggi and Kilcunda is fairly flat and an easy ride. Once past the Wonthaggi Wetlands, where we see egrets and spoonbills, there is no wildlife to be seen unfortunately. The trail looks out over farming land with a few cattle eyeing us off as we pass. The Wonthaggi wind turbines lazily turn near the desalination plant, which is well hidden. The trail is fine gravel and is shaded in places by acacia, paperbark, banksia and eucalypt trees. We stop at Kilcunda General Store for a restorative cup of tea and cake, and to refill our water bottles. And divest some of our clothes as the cool autumn morning is turning into a hot day. The first testing hill is just out of Kilcunda but we soon reach Anderson. Here we come across a steep climb, up towards Phillip Island from the roundabout – I have to push my bike up the hill and have to do the same further along the path. 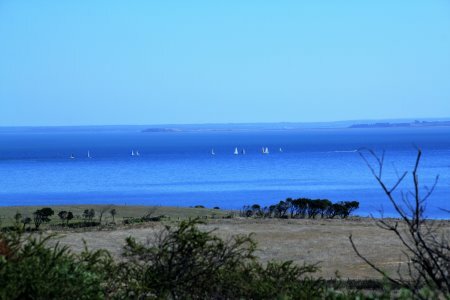 From the hills between Anderson and San Remo, there are great views across Westernport Bay to French Island, the sails of racing yachts standing out against the glittering water. Over the Phillip Island Bridge it is pretty much flat terrain until the small hills at Sunderland Bay and Smiths Beach, a bit of a trial on my aching thighs! In all we cycled 36 kilometres – if you continue into Cowes, add another 4 kilometres. The ride took about 4 1/2 hours but included a lengthy stop at Kilcunda and shorter lunch stop at Newhaven. 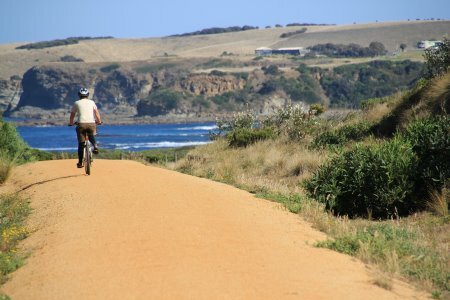 With the cooler autumn weather, now is a good time to cycle the Wonthaggi to Cowes trail! Easter falls in April this year and as I was buying eggs for an Easter Egg Hunt (yes, early I know! ), I started thinking about all the different foods associated with this and other religious observances. Most people would have heard of the Jewish Passover foods of matzo balls and gefilte fish. To break their fast during Ramadan, many Muslims eat dates to begin “iftar”, the meal served after sunset. Hindus eat modaks (a sweet dumpling), believed to be the favourite food of the god Ganesha, during the festival Ganesh Chaturthi. Noodles (a symbol of longevity) are usually served during Chinese New Year’s Eve. 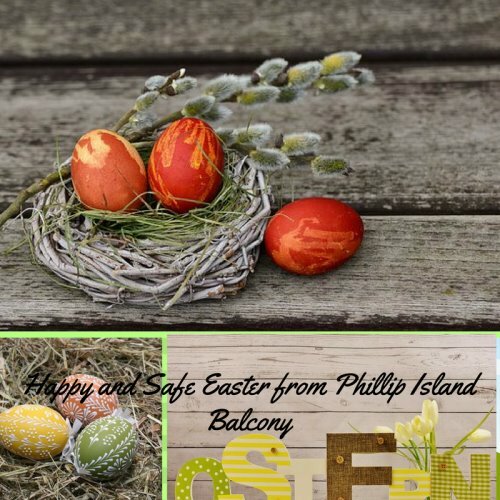 Christians of course eat Easter eggs (a symbol of new life) and hot cross buns. And also fish on Good Friday. In my childhood my mother steamed smoked cod and served it covered in white sauce with parsley, and mashed potatoes. A rather distinctive strong smelling fish but the only fish available in country Victoria in those times, not like the choice of seafood available today. Place flour, pepper and salt in a plastic bag. Add squid rings and seal. Shake to coat rings. Heat the oil in a non-stick pan over high heat. Cook squid, turning occasionally, for about 2 to 3 minutes or until golden brown and just cooked through. Drain on paper towel. 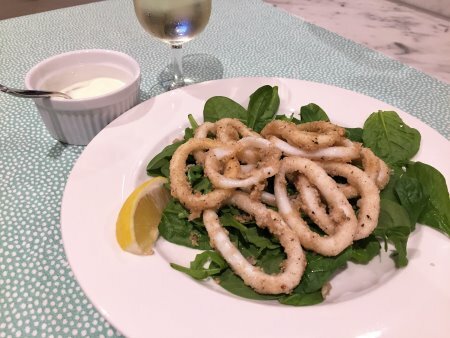 Divide salad greens onto plates and top with salt and pepper squid. If desired, serve with seasoned potato wedges and a crisp chilled white wine. Yum! With the arrival of April it is time for the shearwaters to start their annual migration from Phillip Island to Siberia. The adults usually leave mid-April with the chicks following in late April/early May. Well, we figured it made more sense to see the shearwaters in Australia and not Siberia, so in February we booked a shearwater cruise with Wildlife Coast Cruises. 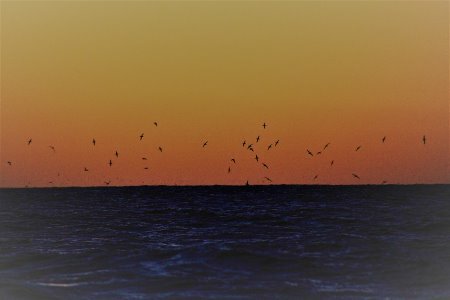 The shearwaters return to their burrows at dusk so we set out at 8.00pm and motored through Cleeland Bight. This is a great opportunity to see the caves dotted along the rugged coastline of Cape Woolamai. There is quite a lot of bird life and we see a young seal resting on rocks near the waters edge. As we approach the point of Cape Woolamai, we see a spectacular peach and orange sunset. The shearwaters must be massing out to sea so we scan the darkening sky. Soon we can see them darting and swooping through the air around us, not yet venturing to their burrows on Cape Woolamai. An interesting fact is that they remain silent, no squawking or calling. This would be so no predators are attracted to their presence. We stay out on the water until the light is almost completely gone and we can hear them back at the rookery, now making an enormous racket. We return to San Remo, in awe of this amazing experience.